Update: You can view all the VIP data here: http://www.insidegameofwar.com/vip/. This page is kept completely up to date so should always have the latest and correct info. 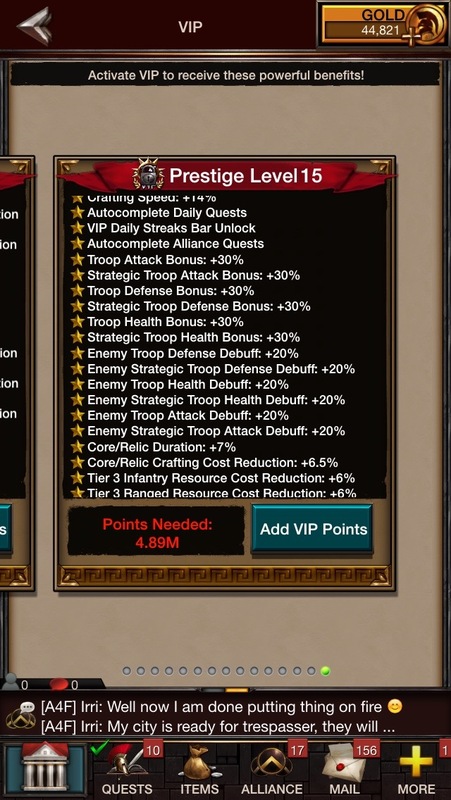 VIP Prestige in Game of War is a full set of additional VIP levels to work through after you have reached level 10 of the standard VIP levels. 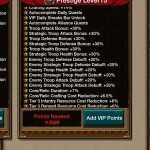 Upon reaching VIP Level 10, you will be presented wit the option of unlocking VIP Prestige by using a Prestige Token. 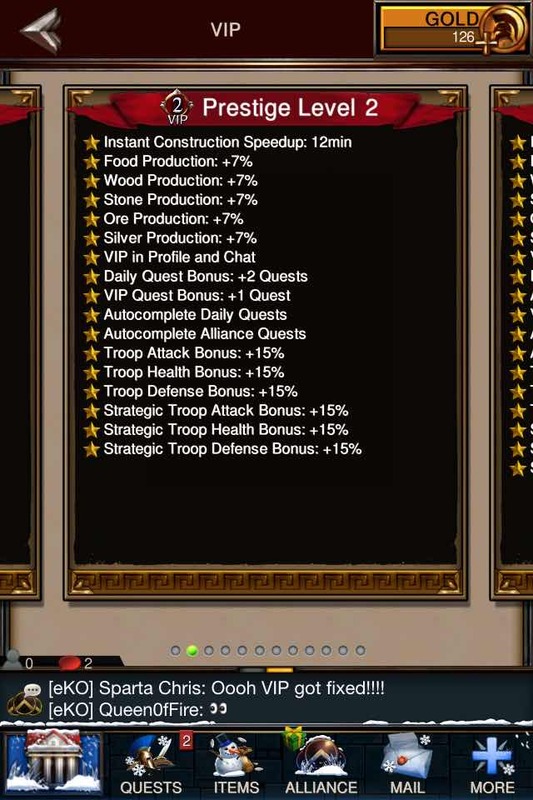 The cost of this token is 10k gold. 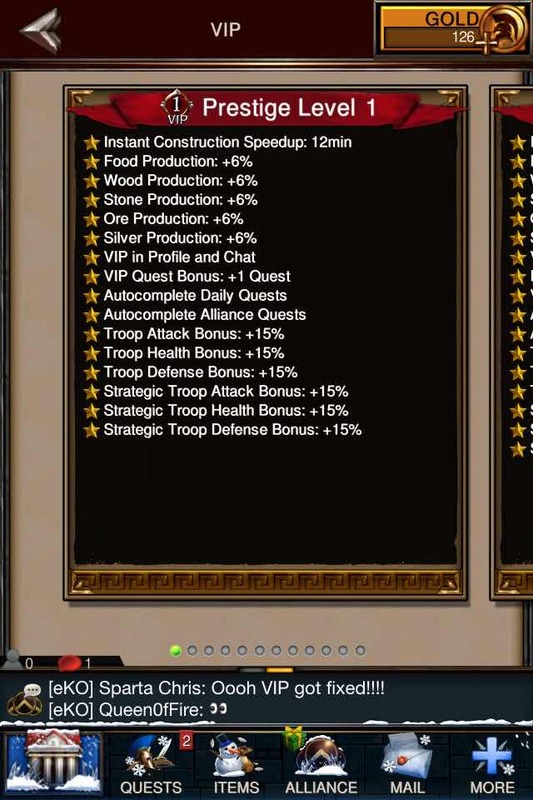 Tokens are also available in certain gold packs. 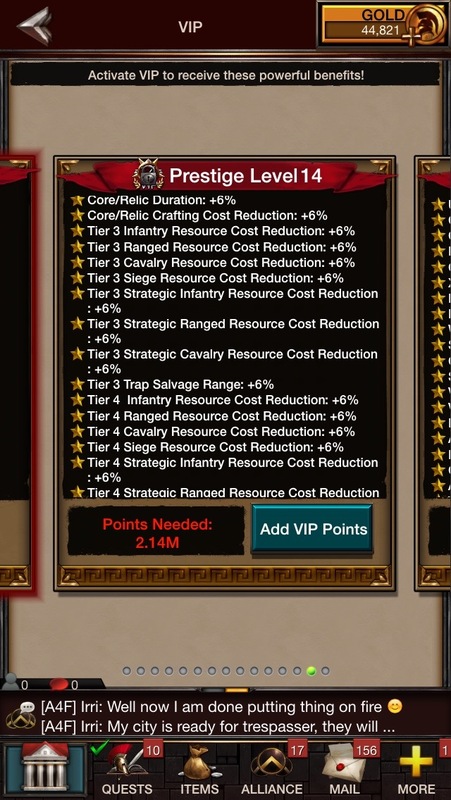 After unlocking Prestige mode you restart your VIP progress back at Prestige VIP level 1 which is worse than Standard VIP Level 10. 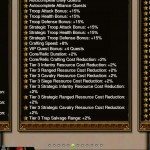 As such you will want to quickly work your ways back up through the levels.. The combat boosts are the same but you suffer a huge reduction in the number of daily, alliance and VIP quests available. 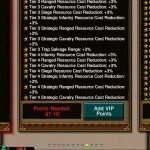 Resource production boosts drop as does your instant construction speed up time. At VIP Prestige Level 5 you start to get some benefits that are not available in Standard VIP such as Infantry Training Cost reduction and Core/Relic duration. 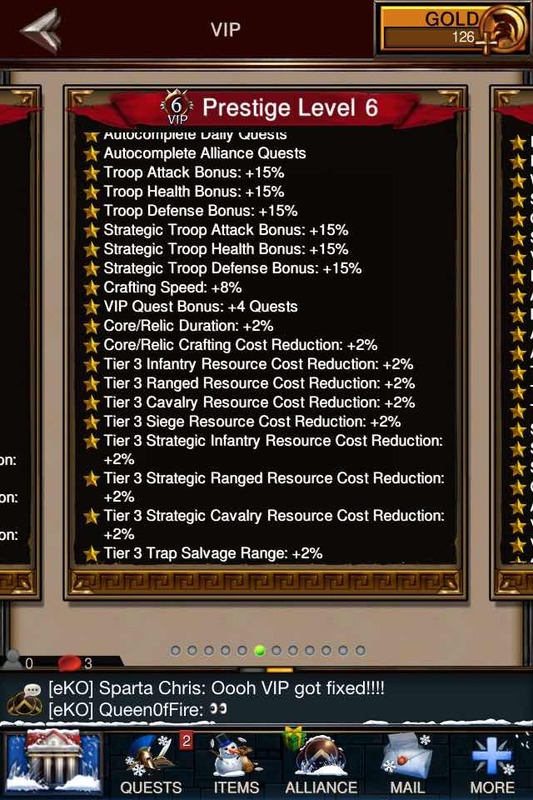 However, these boosts are small. 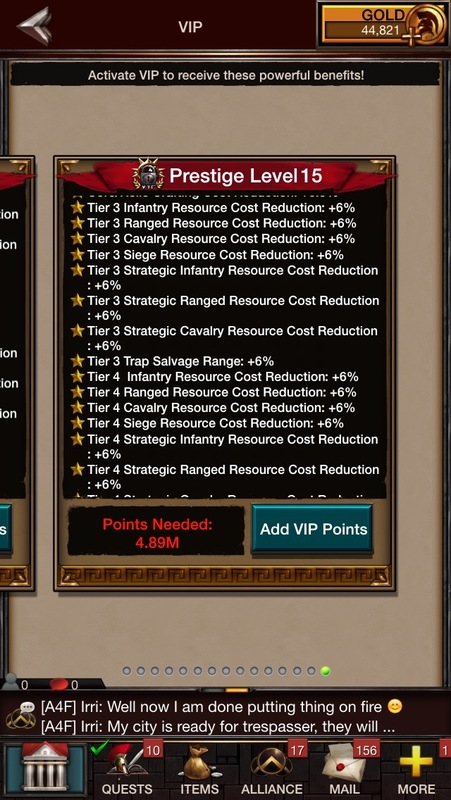 It isn’t until about level 9 that Prestige surpasses Standard VIP Level 10. 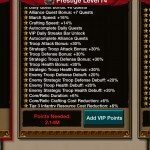 See below for the full set of Prestige VIP benefits. Under normal circumstances you can earn up to 550 VIP points per day from your daily login streak. 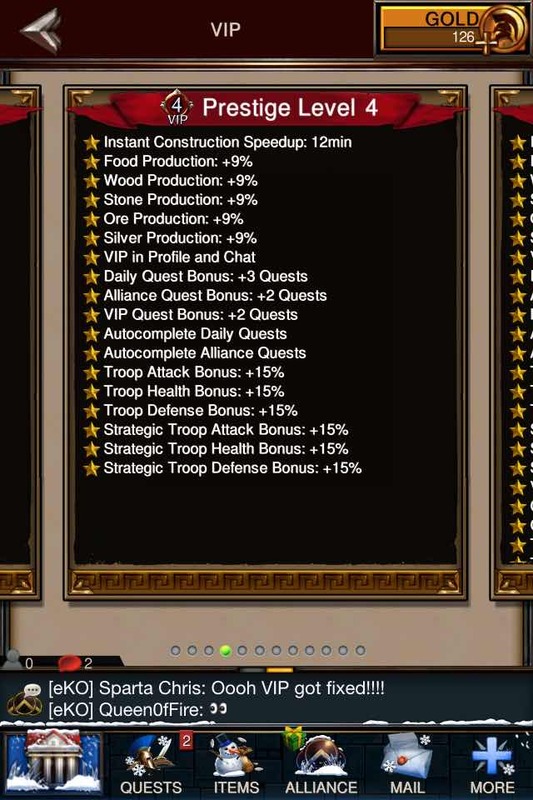 However, once you reach level you stop receiving these until you go Prestige. 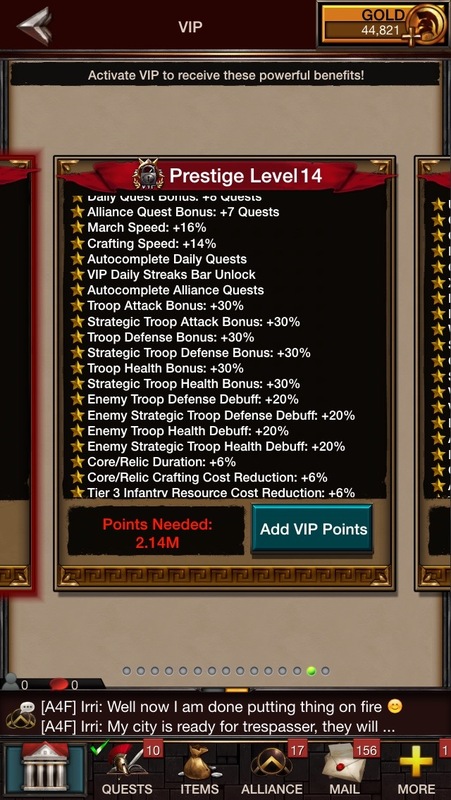 Prestige level 12 also offers the added bonus of an ‘Open all chests’ feature. It is nice they have finally implemented this but I am not at all a fan of it being so exclusive. The fact that low spenders may never have access to this feature is disappointing. 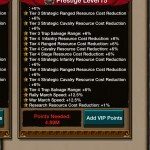 So currently unlocking Prestige VIP level 10 costs 775k gold and level 12 costs 2.9m gold. I don’t have a Prestige button and can’t figure out how to go there. 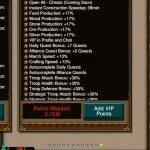 I have been on VIP 10 forever and no points adding up. I am current VIP lvl 21 and my VIP points don’t seem to be increasing at all. 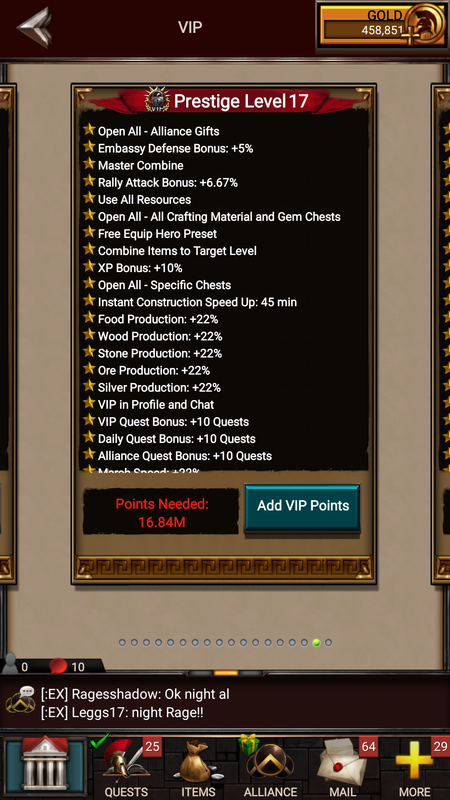 With banner boost my quests are all epic rare and legendary but my VIP doesn’t increase. Any ideas how to increase my VIP? I am currently at VIP 25, I was unaware of prestige until now. 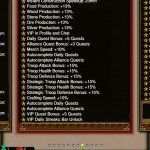 I want to go prestige so I can eventually the ” unlock all” feature. 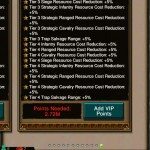 Is there any way around it resetting to VIP prestige 1? 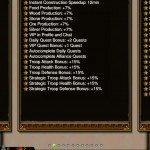 I hate to waste all the points it took to get me where I am now. 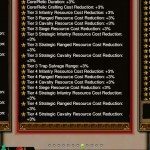 What does “Use all Resources” do? Takes all your clickable RSS into your menu items. No more clicking the RSS out each time, however, leaves you exposed to losing it all should you ever be zeroed. What does “open specific chests” mean for lvl 12 prestige? Does that mean you can open all chests except for gem chests? it mean you can open the specific type of chest you want to.. not open all chests you have in inventory. 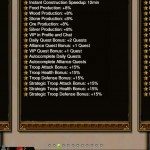 Does the +10% hero xp compound with each level from 13,14,15? so I am looking at my VIP status.. shows 99,999 total points. Im at VIP 10. 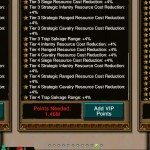 If I switch over to prestige, does that total points start from scratch? 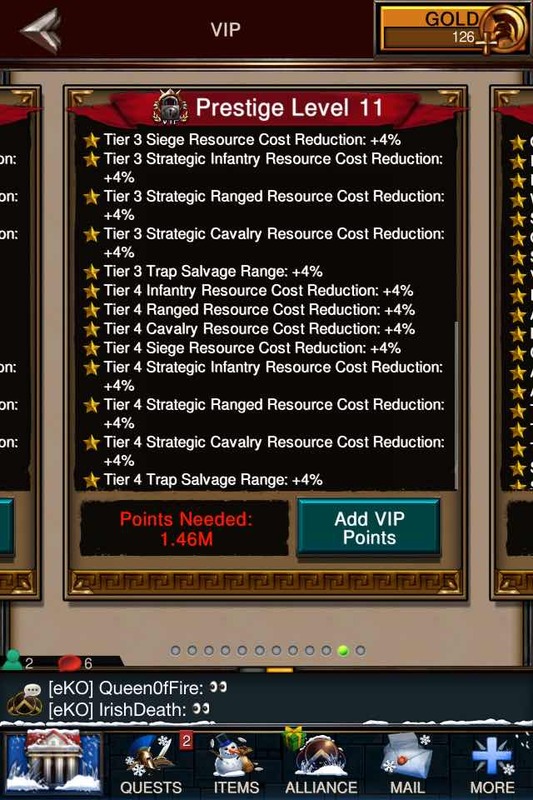 New level 13 – 4.16 Million Points!! That’s a long way away……. VIP13 is great. 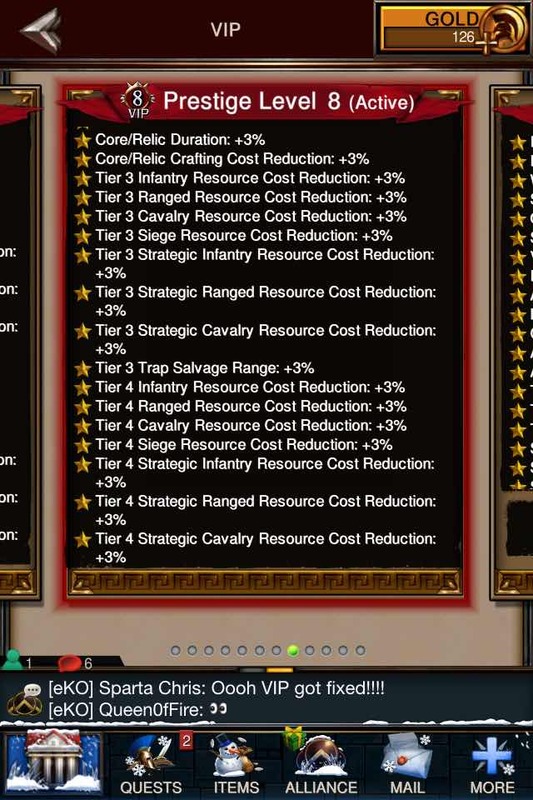 Combining my cores are so much easier. Thank god. 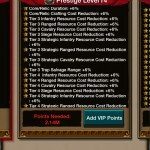 So, other than the initial 10k gold needed to unlock prestige, do you have to pay additional gold for each level of prestige, in addition to vip points, to advance levels? When you move from VIP 10 to VIP Prestige 1, does your login streak for VIP points stay active? Do I still get free VIP points every day? 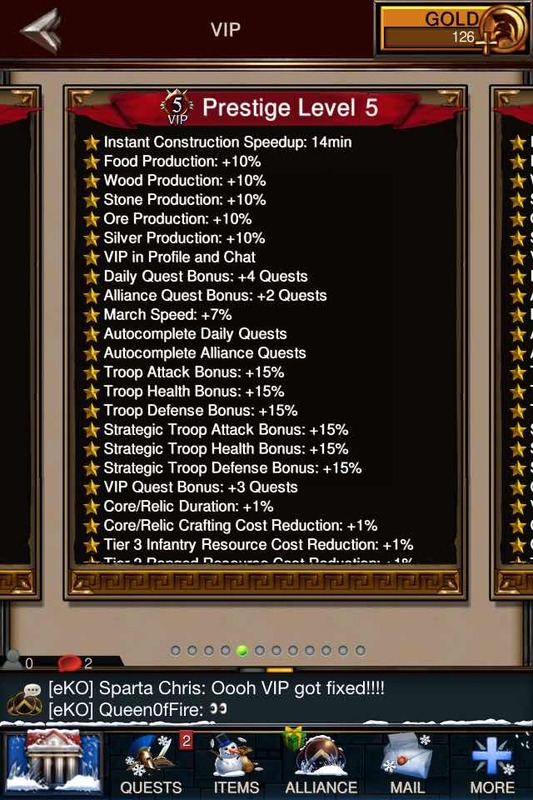 Also, I have read conflicting reports online about whether daily quest auto-complete and alliance quest auto-complete are available at VIP Prestige 1. Available or not? 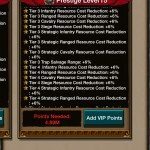 I have been ask to paid 10k gold for unlocking VIP prestige. 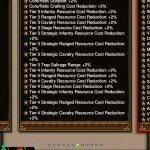 Is there a way around. 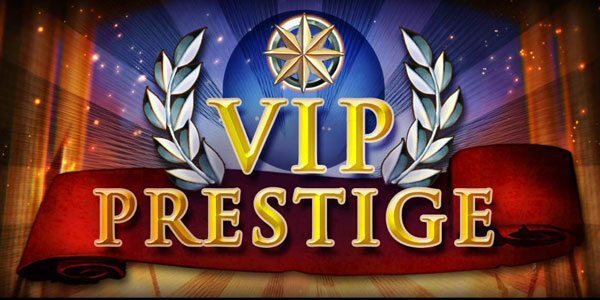 Every now and then there is a VIP gold pack that comes out, which has the prestige included in it, other wise you will have to speed the 10k gold. 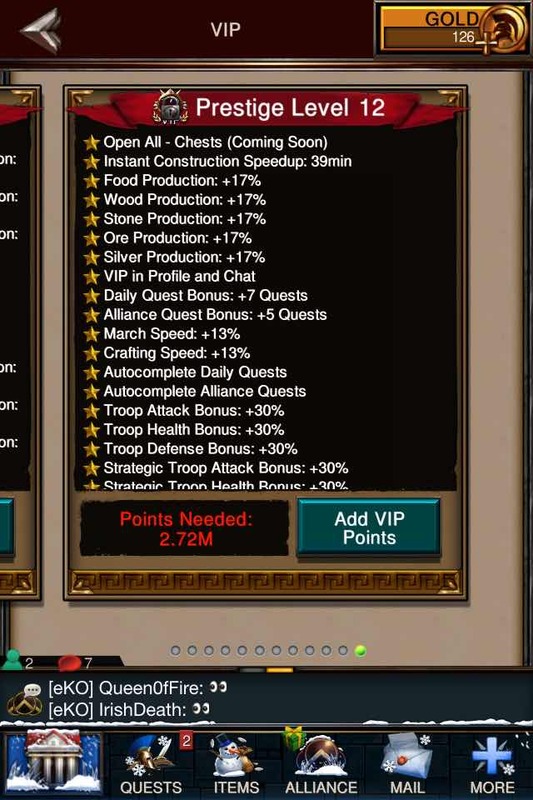 Hi, the option to switch should be on your hero VIP screen? If not try contacting MZ directly about this. 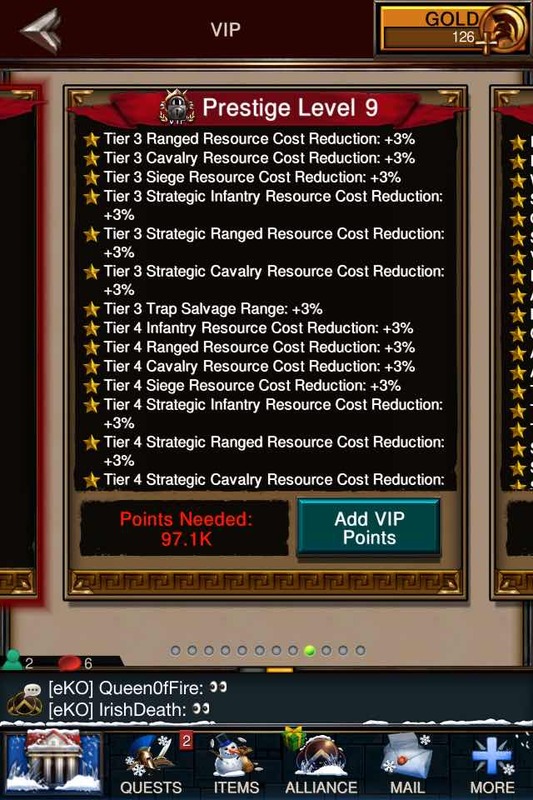 You havento max level ten to be able to jump over to prestige mode, so your level 10 prestige bar should full, all the way to the right, if not, thats your problem. 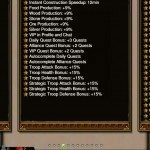 What is the max number of points earned per day it can get up to? 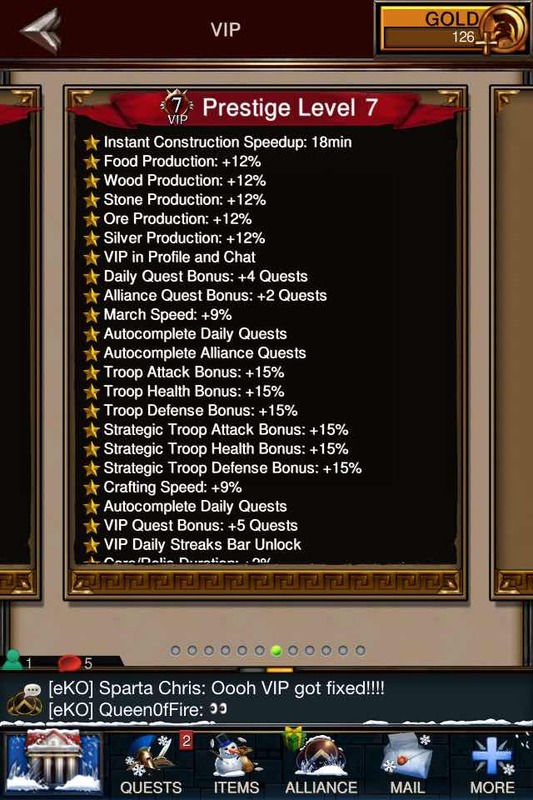 Hi, 550 per day is the max. I’ve been sitting on VIP 10 for a while and I have about 75,000 VIP points saved up. 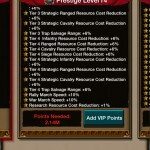 How far will that get me into the prestige levels? Which level is somewhat comparable to VIP level 10, at least in construction tome if nothing else, and how many points do I need to get there? Can I cash in all my points at once? 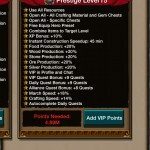 It says right in the article: 75,000 will take you to level 7. 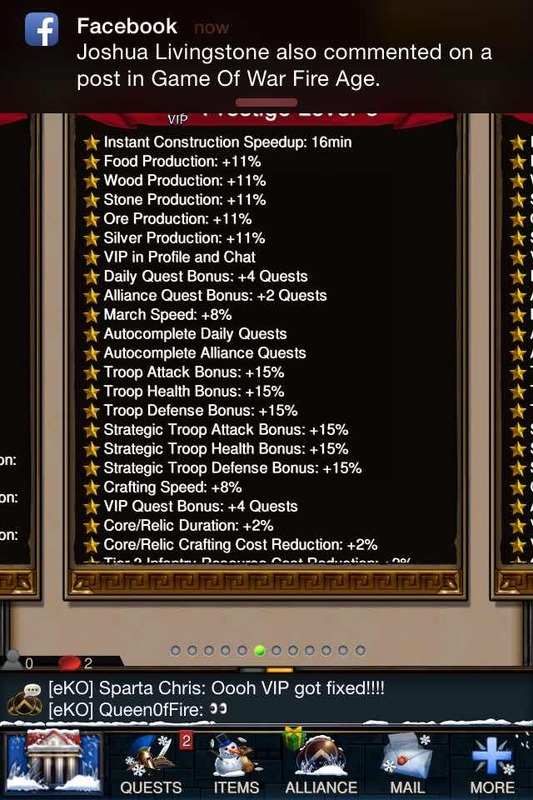 Level 9 is where it appears to be worth it (you still lose 3 minutes on construction speed-up but the other benefits seem to compensate). 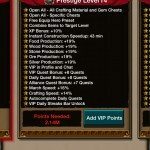 You need 274,000 points for level 9.
so in your opinion is it worth it to go to prestige? Hi, I think it is yes. The problem is that if you wait at VIP Level 10 Normal then you lose your 550 points per day login bonus. I’m a little confused. I can use my VIP points i collect and don’t use because I am VIP 10. 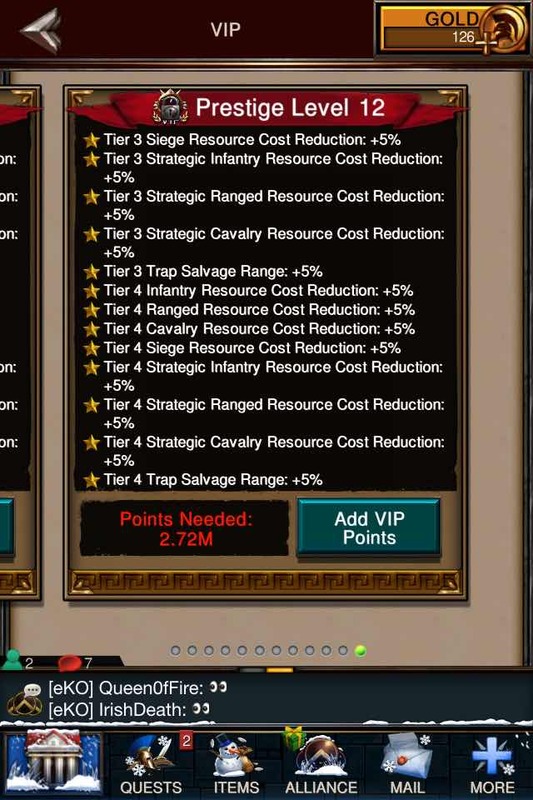 I do not have to use any gold except the initial 10k token? or do I also have to use gold with my VIP points? 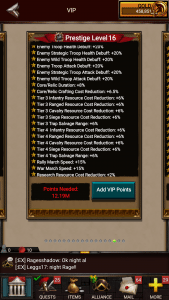 Hi, yes you can use the VIP points you collect towards Prestige. 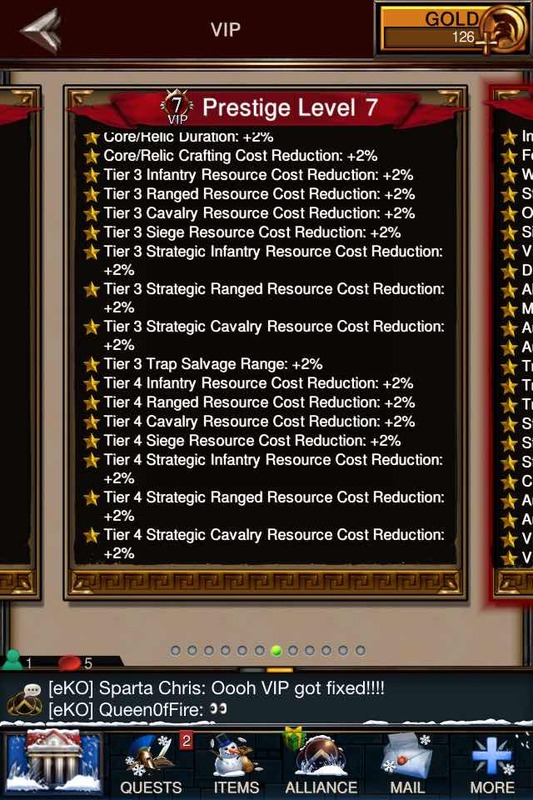 You don’t have to use Gold if you don’t want to. 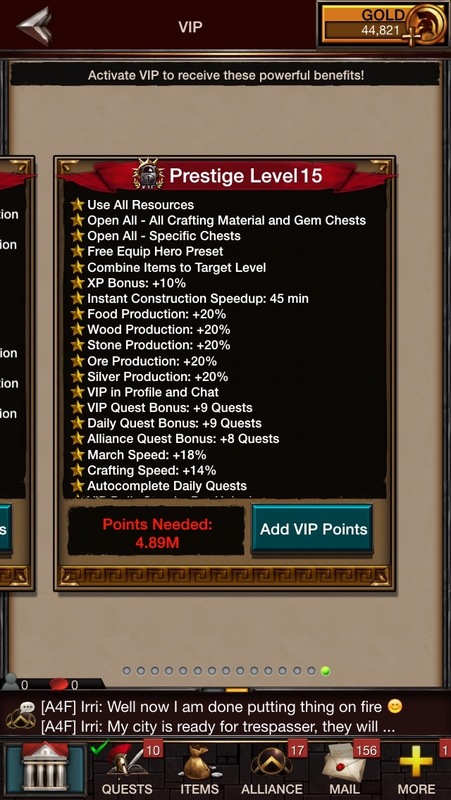 The open all chests being set so and not available until prestige 12 is completely ridiculous. 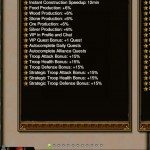 My hero finally hit level 50 and not I want to start crafting sets of armor, etc. I have a few thousand chests and now I have to open them one at a time……I couldn’t agree with you more. Totally agravating . I have sent a message to MZ on it, waiting a reply. You can actually open 3 at a time if you do it fast! 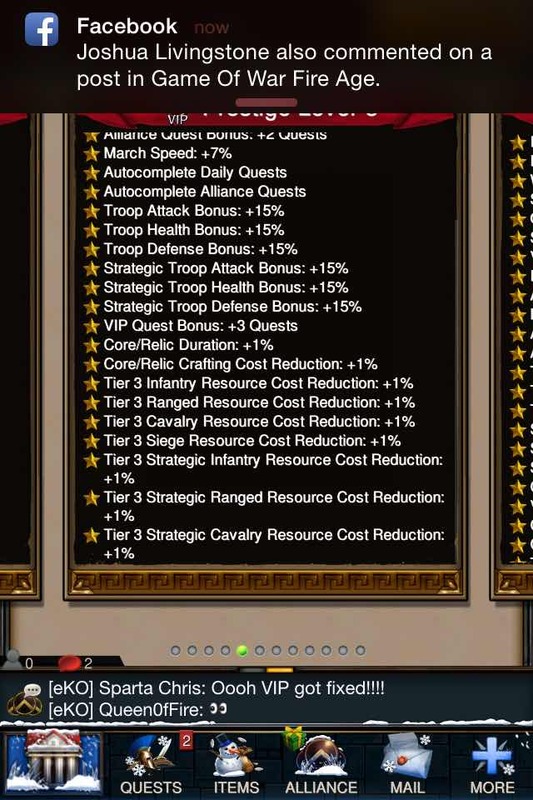 even 4 if you’re a true emperor. So for lvl 1 it is 1 point and for lvl 2 it is 450 and lvl 3 it is 1950. Does this mean that, for instance, lvl 3 is a total of 1950points, or add all the three and it would be 2401 points to get there? I’m wondering the same thing. 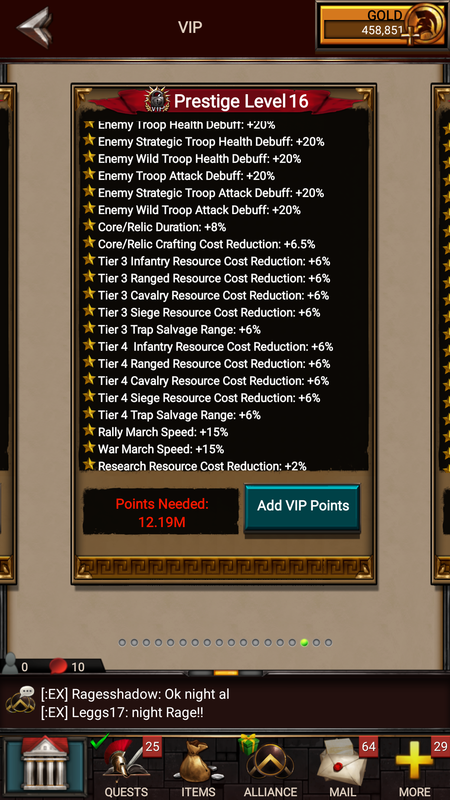 I’ve been on VIP 10 for about 2 weeks now and just saving up VIP points before I go prestige so that I can quickly move up to a lvl that is equivalent to VIP 10. So are these point totals cumulative or those necessary for just that lvl? 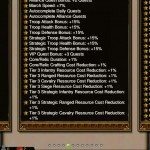 Hi, the numbers are cumulative so level 3 is 1950. 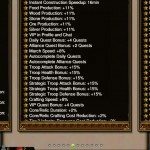 What about this “open all chests”? 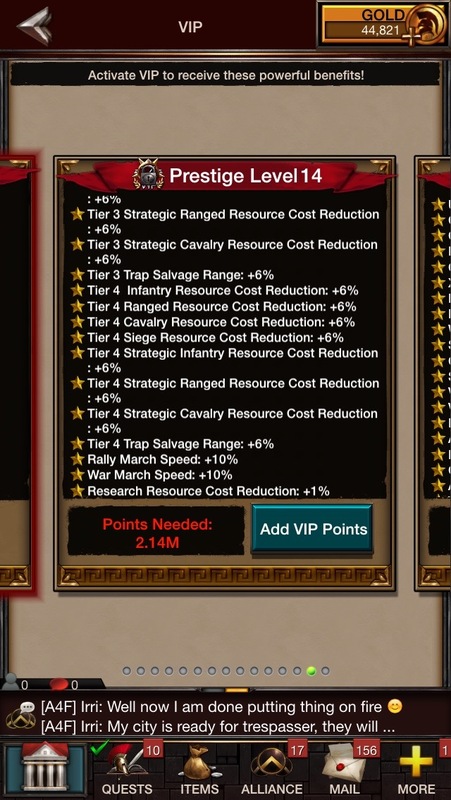 It is unlocked at VIP Prestige level 12. It lets you open all chests with one button. 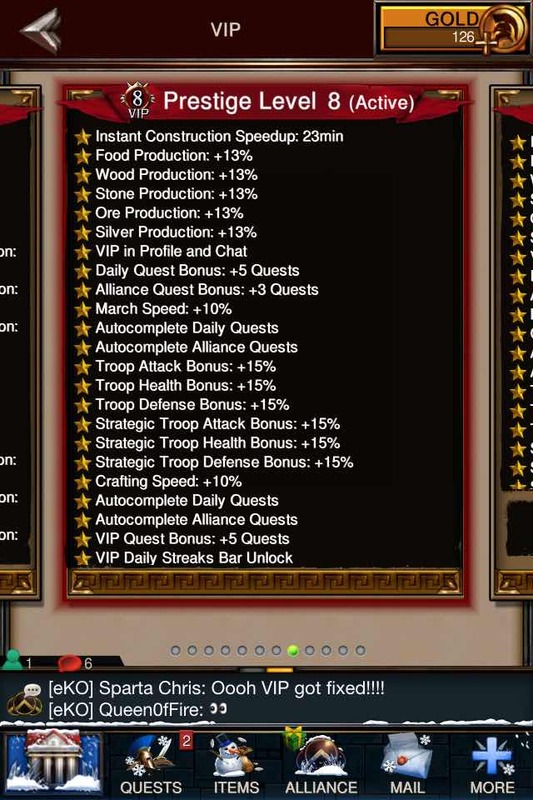 Its unclear here, can you autocomplete alliance quests at Prestige 7? 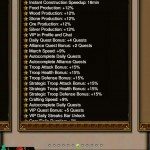 Hi, Alliance quests yes, alliance city quests no. So each VIP point costs 1gold? 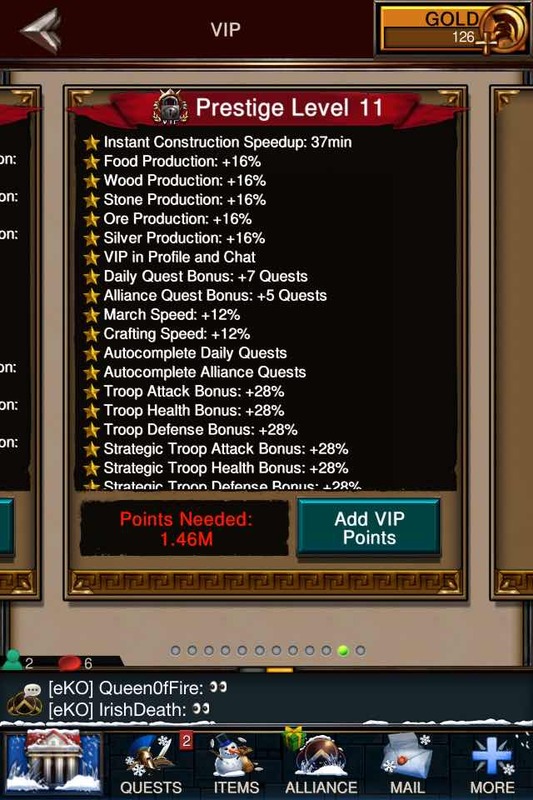 Also can I use the VIP points I’ve won in events or do the VIP points need to be ‘prestige’? 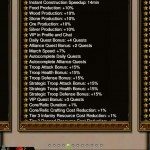 Does your accumulated time reset to zero when you go prestige? 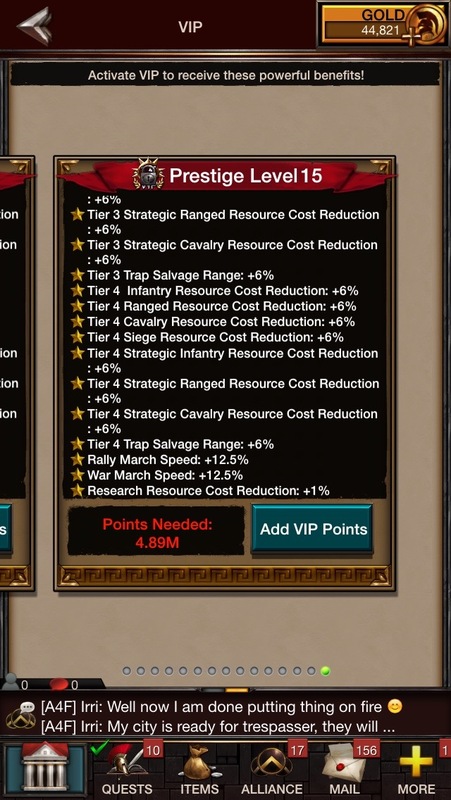 I believe it still continues once you convert to prestige.